The very first stitch. Thank goodness the fabric really isn’t that green; the photo below is much closer to the actual color. May 24, 2011, the day I started stitching the biggest project I’ve worked on to date: “And They Sinned” (ATS) by Exemplar Dames Design Co.
It’s been pretty easy going, once I worked out a few bugs. The first was the stitch count. Maybe others haven’t had this difficulty, but on my copy of the pattern it definitely was NOT 809 x 169. I counted 828 x 174. It seems Satan had to cause a little trouble right from the start. Thankfully, I always buy an extra three inches all around so it’ll only affect it by about a third of an inch each on the top and bottom. The total size will wind up being 54″x16″ before framing. The other obstacle was figuring out how to deal with all that excess fabric. I like to let the thread run through my fingers so it doesn’t tangle while I’m pulling it from the back. My solution was to roll it as best I could and secure it with quilting safety pins on the edges. I’m using 34 count Oaten Scone (don’t you just love that name? ), a lovely evenweave that is a little easier to use than linen but with the occasional nubbly effect linen has to give it depth. 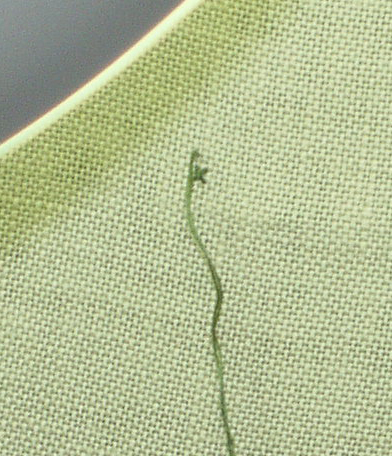 For floss, I’m suing Sampler Threads from The Gentle Art. The berries you see above are in Copper; the vine is in Shutter Green. Amazingly, for a sampler this large, there are only 28 different colors. This piece will definitely be an investment. The pattern was $36 when I bought it (it now runs from $48-$60), the fabric was $50 and the floss will be around $75. That’s before I frame it, which means I’d better start saving, since that’s likely to run $300-400!